I actually have never had peaches and cream, but I think it’s a thing right? There is a song but I highly doubt they were talking about food in that one 😉 haha. Anyway, I recently received a gigantic package from Arctic Zero with all of their flavored pints and it got me thinking – what are some fun ways I could eat ice cream? So I decided to experiment with this a little bit. One of the flavors is Vanilla Maple and I thought this would go perfectly with the one peach I had left. Delicious, juicy peach. I’ve been wanting to roast a peach and see how it works out. My George Forman needed cleaning though so I opted for the pan. I didn’t add any oil or spray to the pan, simply because I didn’t think it was needed. I wasn’t trying to fry the peaches, just warm them up a bit. I’m also not a big caramelizer just yet – only did it once in my life. You could probably actually caramelize the peaches if you add some coconut oil and maple syrup while it’s frying, perhaps. I thought the combo was already so sweet tasting though, that it really wouldn’t need any extra sugar in there. Take the pint out of the freezer and put it on the counter to soften. After about 20 minutes, take your peach. Cut the peach and slice it into small pieces. Put the slices on a nonstick pan (sprayed or not, mine wasn’t) and cook on medium heat. Sprinkle with 1 tsp cinnamon. Cover the pan with a lid for a bit, uncover, stir, and cover again. Do it a few times but don’t leave it covered for too long at a time. The peaches will start to pull juices a bit and mine started sticking a little to the pan (since it wasn’t sprayed), that’s when you take your pint and take two scoopfuls and put them onto the pan. 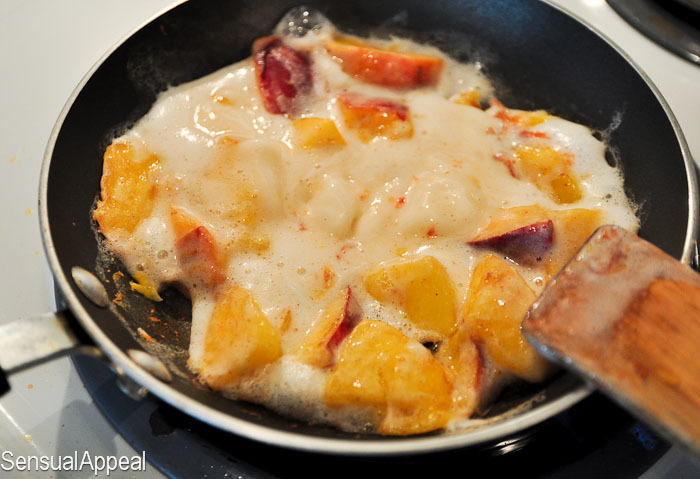 Stir it along with the peaches and let cook for a while longer. Take a bowl and put the brown rice cereal on the bottom. Take the rest of the ice cream from the pint and put it in a bowl (you’ll be left with 1/3 of the ice cream in the pint, put it back in the freezer). 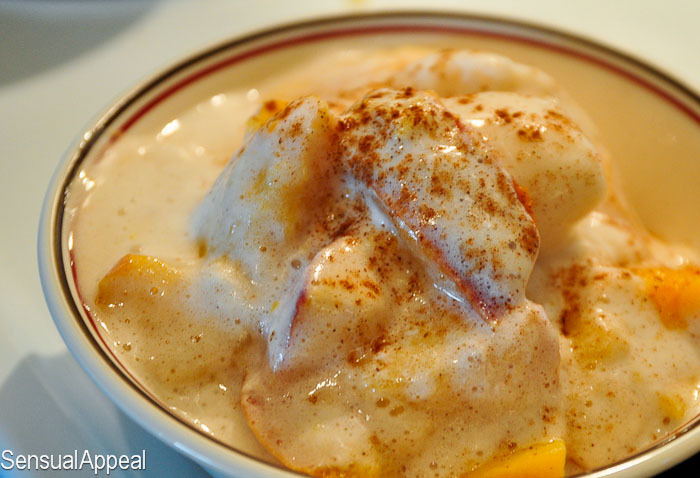 Once the ice cream on the pan has melted and warmed and you think the peaches are nice and warm enough to eat, take those and pour them over the ice cream and rice in the bowl. Sprinkle with the remaining 1 tsp cinnamon. Enjoy! Make sure you enter in my giveaway to WIN the same package I got from Arctic Zero! 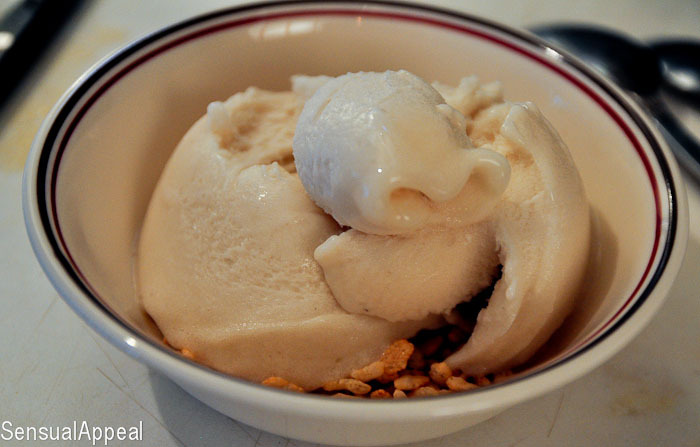 Have you ever tried Arctic Zero ice cream? Oh my gosh, that looks soosooooosooooo good, I can’t believe the stats on it! YES, I want to win that amazing prize pack and YES, I want to try that recipe! Oh my gosh, I don’t think I’ve ever had organic peaches actually. I bet the taste is out of this world, as it is with all organic fruit. I need to try them organic! 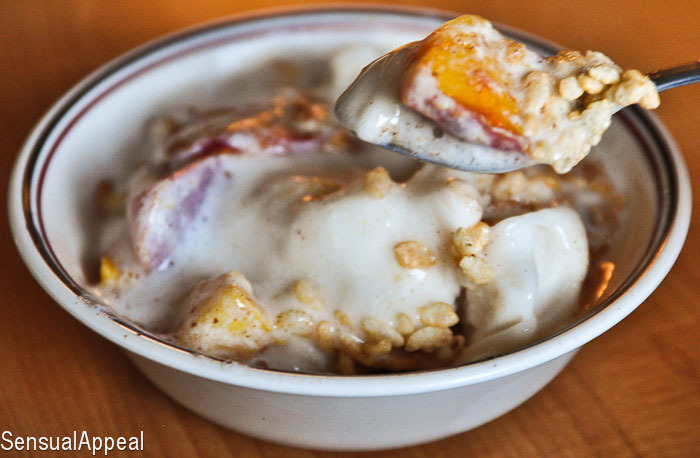 What a lovely way to enjoy peaches! I have purchased the vanilla maple at least half a dozen times and never EVER thought to add fruit to it! Bahaha! I can’t help it…the little kid in me comes out whenever I see any sort of frozen dessert! 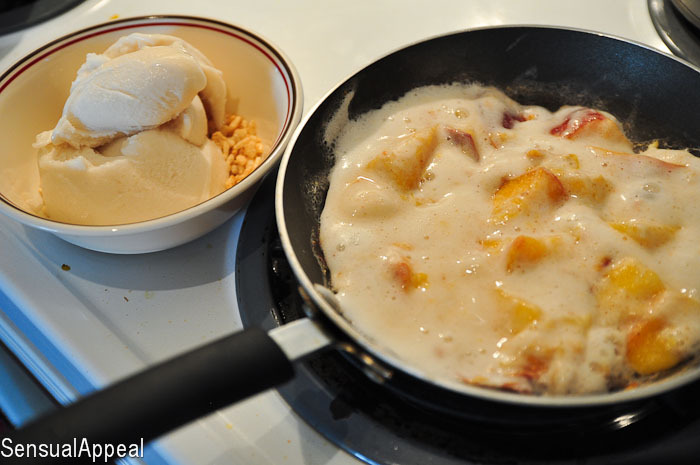 But I will definitely have to forego the cereal and chocolate chips and give this a try in the VERY near future…especially since peaches are SO good right now! Mmmm! That is so funny, I am eating a bowl of Erewhon Brown Rice cereal right now….love that stuff! This peach ice sounds so yummy. Love! Glad you like it 🙂 And I LOVE Erewhon cereals!